Llangrannog & Cilborth Beaches BeachOriginally a hidden village above the old port, Llangrannog is now one of Ceredigion's most popular beach destinations and is part of the Wales Coast Path. The sandy beach nestles below the cliffs and is a favourite destination for families on days out, beach holidays and with surfers. There are great rock pools to explore, and find colourful seaweeds, shellfish such as limpets and mussels as well as starfish and crabs. The beach also has a series of caves, carved out of the contorted rock formations by the sea. Activities at Llangrannog are suitable for the whole family and include sailing, windsurfing, kayaking and surfing. Nearby, Ynys Lochtyn is a tiny peninsula off the coast of Llangrannog and a great place to spot seals. Blue Flag and Seaside Award beach. Toilets, shops, cafes, pubs, parking (free parking 800 yards). Lifeguard service provided 10:00 - 18:00 25 May to 1 September 2019. Cilborth beach is immediately north of Llangrannog and is accessed by steps down the cliff or from Llangrannog beach when the tide is low. This fantastic beach is sandy and secluded in a hidden cove. It can be easily identified by a dramatic tooth-shaped rock known as Carreg Bica. According to legend this was a tooth that troubled a local giant, which one day he ripped it out in anger, whereupon it happened to land in Llangrannog! 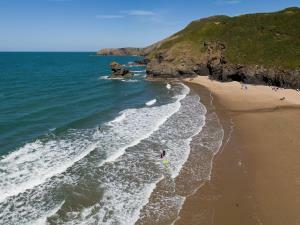 Originally a hidden village above the old port, Llangrannog is now one of Ceredigion's most popular beach destinations and is part of the Wales Coast Path. The sandy beach nestles below the cliffs and is a favourite destination for families on days out, beach holidays and with surfers. Dog restrictions apply May to end September. Turn off the A487 Cardigan to Aberaeron road at either Brynhoffnant onto the B4334 or at Pentregat onto the B4321.